I wanted to share this design I created a few years ago. This was my first attempt a wearable art and creating an avant garde piece. The entire dress is made from paper, mostly resused items and and natural elements I gathered from the woods. 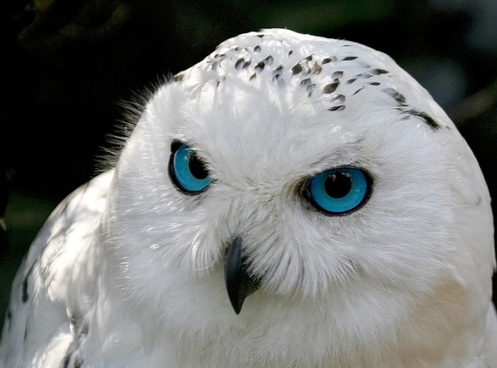 Looking at my Snowy Owl design now, I am still amazed that I was able to create something so fantastical. 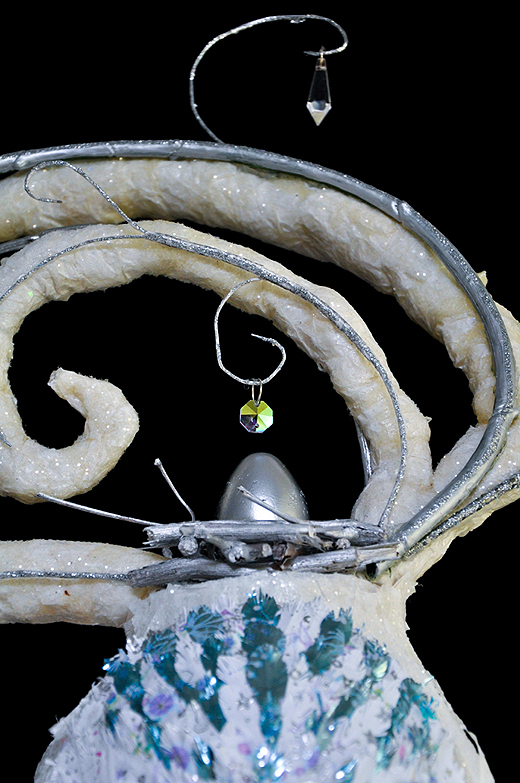 I was asked by the ManneqArt organization to create a wearable art sculpture for their upcoming contest. They needed an example of a design that was a combination of fashion and art. I don’t usually make things look this abstract so it was very challenging and a lot of fun to go crazy with my creativity. She is 7 feet tall and a little intimidating. After working on her in the wee hours of the night, I thought I saw her blinking. I am happy with the way she came out though even though she did scare me at times. She almost has a woodland, fantasy, Elven princess look about her…very Middle Earth. 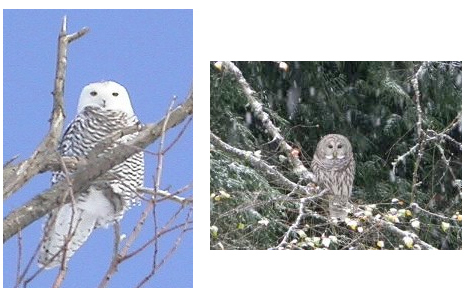 My inspiration was drawn from the beautiful blue-eyed snowy owl perched on frozen tree limbs. I wanted to capture the imaginary of snow drifts, icy branches and the majestic night bird. I decided to make my wearable art design completely out of paper and natural elements. I like using unconventional materials to create my designs. I think it adds interest especially when it is a wearable piece. 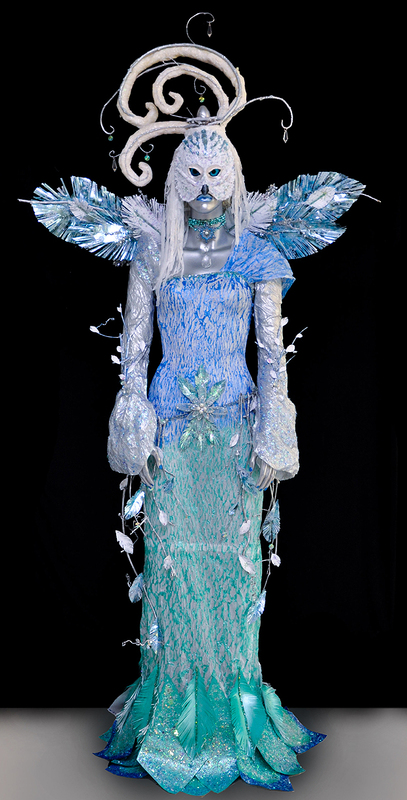 The dress was made from tissue paper that I crinkled and painted to give it an icy look and I used branches I found in the woods to accent her dress. 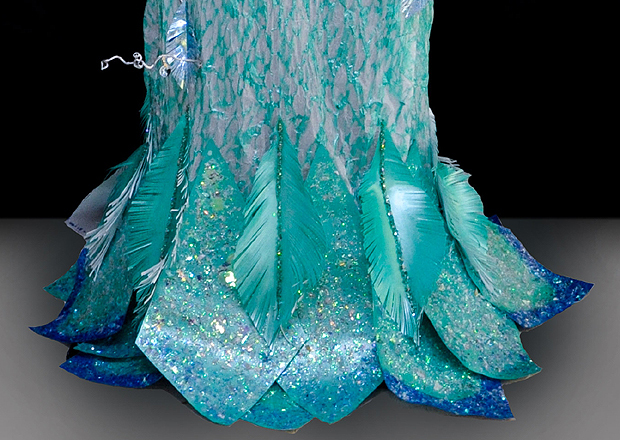 The feathers were created from holiday wrapping paper and I added chandelier beads to the twigs to add more of frozen feeling. I love how the branches have the curly grape vine accents. I wanted to put a nest on her head just because I thought it would be an interesting touch. I used chandelier crystals to hang from her icy snow drift headpiece to give the illusion of icicles. 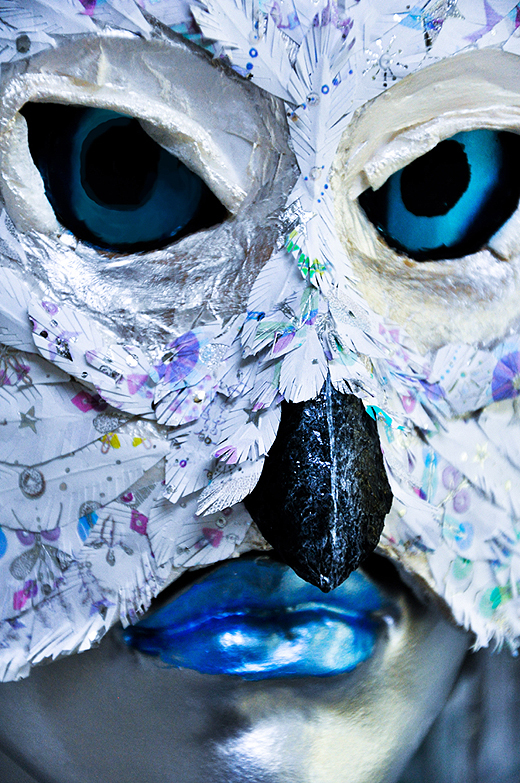 I made tiny feathers out of wrapping paper to create the textured snow owl mask. 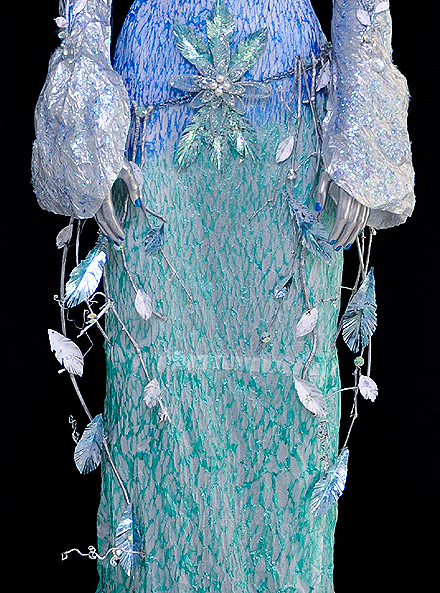 I embellished the bottom of the dress with feathers and shapes decorated with iridescent cellophane to make it look more like she is standing in an icy terrain. 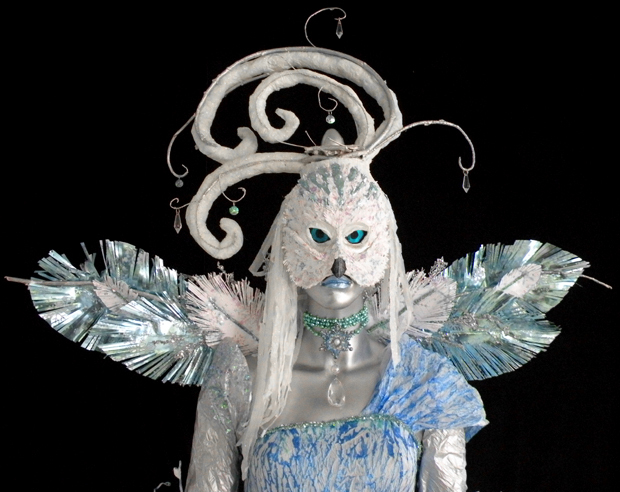 My snow owl princess has been making her way around Maryland promoting the ManneqArt contest. Her next destination will be at Colombia Mall in Howard County Maryland. So beautiful! You are so talented and amazing. Can’t wait to see your next project.